The products of Schenectady and Montreal are our favorite form of motive power, so we look them up whenever we can. We've seen RS1l's and an RS3 on the Winchester and Western, these guys were working REAL hard, immaculate C420's (pretty) and an RS36 on the Apache, M630's on the CP (smoke), C424's, RS18's, M630's and an RS36 on the D&H (lots of smoke) M630's on the Cartier, an RS3 on the Lamoille Valley, RS1's on the Green Mountain, an ex P&W M420 on the Mass. Central, C424's on ST, C420's and M42OTR's on the Roberval Saguenay, an S1 on the Maine Coast and ex FA "powerpacks" on the Long Island. Chase Freeman (Grundy VA US) on 2017-03-03 16:33:41. 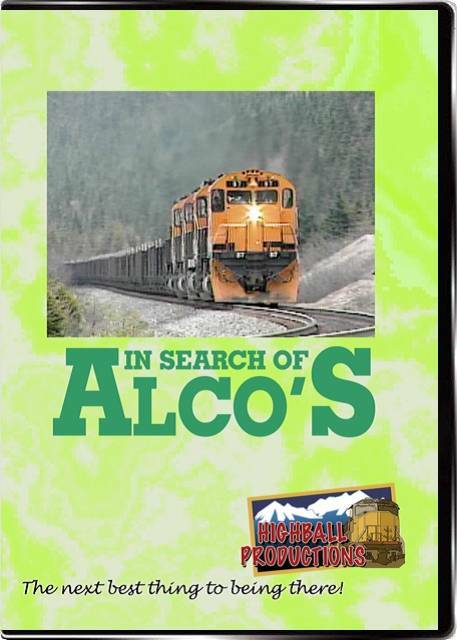 If you are an ALCO fan, this video is a must have. You'll see a wide variety of ALCO locomotives hauling tonnage all over North America. My personal favorite in this video is Winchester & Western stuff at the very beginning. This is for sure one of my favorite videos in my library. kc (usa) on 2012-02-07 13:35:42.
this movie is not for you.